Corporate executives are busy people. They are pulled as many directions as they are pulling. They are successful and spend a great deal of their workday trying to remain successful. The Senior Corporate Executives have climbed the ladder; their income and portfolios reflect a professional life of creating profits and they have been richly rewarded for doing so. Senior Corporate Executives are also often investors, a unique brand of investor with an average to above-average knowledge of investment products and services, and a desire to see their investments succeed. Just as they do in their professional lives, Senior Corporate Executive pay attention to detail in their investing lives as well. The answers to those questions can be found in Spectrem’s Perspective Senior Corporate Executives: How to Serve the C-Suite, which provides insights into executives, including their most significant financial concerns, how they gather financial information, and their expectations of advisors. The most important trait of Senior Corporate Executives related to their investment habits is that they tend to be more likely to use an advisor than investors in other occupations. There are levels of advisor-dependency, but Senior Corporate Executives are the least likely to invest on their own. However, the fact that Senior Corporate Executives employ the services of a financial advisor does not mean they are dependent upon the advisor for financial and investment information. 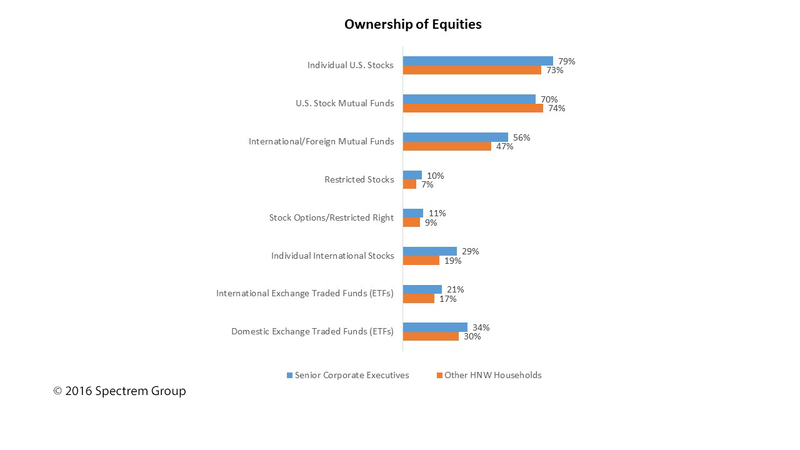 Almost half of Senior Corporate Executives consider themselves very knowledgeable about financial products and investments, and that percentage is much higher than the percentage of investors from other occupations, according to the Spectrem report. What does that mean to the advisor? It means the investor could be a challenge. Executives often believe they know more about investing than professionals do. It is likely they will want to discuss products and services in greater depth than many other investors do. Advisors must be alert to how they talk to knowledge investors so as not to give the perception they are talking down to an investor who knows their stuff. For Senior Corporate Executives, the saying “time is money’’ is a mantra, but as investors executives take the time to be involved with their investing. While they may not always be available to do business over lunch, corporate executives want to be involved and will make the time necessary to discuss investment plans. Those plans are likely to include equities and international investments. While some investors work in fields that are domestic in nature, Senior Corporate Executives are likely to have a global outreach professionally and that could create an interest in global investments as well. The Spectrem report shows Senior Corporate Executives have a greater interest in international investments than investors in other professions, so that is an area advisors need to look into in discussions with executives. The report also looks at how investors use mobile technology such as smartphones and tablets, and that information comes into play when advisors talk to executives. Senior executives are very interested in whatever they can accomplish from an investment standpoint while on their smartphone or tablet, and they express a greater interest in that capability than those in other professions. That includes texting. Although federal guidelines require compliance regarding electronic communication, advisors working with Senior Corporate Executives can expect to get queries from clients via text and should know how they are allowed to respond form a legal standpoint. When a Senior Corporate Executive enters into a relationship with an advisor, it is often NOT because they need assistance knowing where to invest, but because they need help with the fundamental functions of investing. Time is of the essence with corporate officials, and an advisor will be working to assist with timely investing moves for someone who cannot concentrate on investing because of the time constraints that exist from their work. Senior Corporate Executives are also going to be appreciative of information an advisor can provide which they don’t already know, which might be difficult, because executives are often the most knowledgeable investors around. They are likely to have great regard for investment updates that are up-to-the-minute. Prepare for meetings and conversations by updating yourself on the current status of key investment products and services.